In the Dark Ages after the Romans abandon Britain, the Saxon threat is growing stronger every year. For sixteen-year-old Rhys, whose father was killed by Saxon raiders, this means he must leave his family and home at his grandfather’s estate to go to the monastery school of Caerllion and study under the tutelage of the harsh Abbot Aidan. But Rhys’ real ambition is to become a warrior and avenge his father. So he is overjoyed when – despite the protests of Abbot Aidan – he is given the chance to train under the command of Prince Arthur himself, the greatest warrior ever to protect Britain. Rhys works hard to prove himself both to Arthur and to his fellow Colts, but is always eager to go home to visit his family – and Helena, the daughter of his grandfather’s steward, Rhys’s first love. When Helena is kidnapped, Rhys stops at nothing to rescue her. 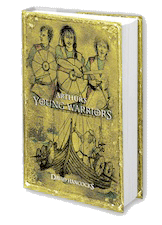 In Caerllion, Rhys and his friends study the thrilling art of warfare, learning swordfighting, horseriding and sailing. But when the Saxon hordes threaten to invade his homeland, Rhys finds his training suddenly becomes real. With the help of his friends, Rhys must find out whether he has the courage to fight for his country, avenge his father – and earn the love of Helena. Packed with action, intrigue and romance, this is an exciting tale of friendship, courage and first love. David Hancocks has a life-long passion for history and is now able to recollect his life as a sailor, builder and countryside lover and concentrate on fiction and non-fiction books. The decision had finally been made - Rhys, now sixteen, was going to the monastery school at Caerllion. After weeks of discussion and anguish, the clan would now be relieved to know that Rhys had made the decision to leave Penhal, his grandfather's estate. It fell upon his younger sister, Olwen, to rush around the settlement with the news; little did she know that Rhys had made up his mind some time ago. He knew exactly what he wanted to be when he grew stronger, and revenge was burning in his young heart. His grandfather's warriors boasted of killing Saxons - soon he would join them. As she skipped through the doorway of the wood-framed hall into the spring sunshine, Olwen shouted through all the house doorways and waved her stick at the barking dogs. The puppies, especially, thought this was a new game and hurtled through the gateway in front of her. Skipping and running across the field to the river, her first call was to the priest up on the hill. Olwen knew that he would be delighted - it was just what he had been hoping for. "Rhys is going to school. Rhys is going to school," she shouted. Everybody was going to know. Climbing onto the bridge, she heard the younger children leaving the stockade to join her; they knew that running up to the cemetery, and the priest's small house, would mean honey-cakes and milk. Ruthall, the priest of Penhal, strode from his garden on hearing Olwen's shouts. His joy was obvious as he scooped up Olwen and hugged her tightly. "This is a blessed day, Olwen. Brother Cunval would have been so pleased that Rhys wants to be educated." Ruthall glanced across the cemetery at Cunval's grave. "Are you sure Cunval's not listening?" joked Olwen with a sly grin. "After all, he's only just up there, you know." She pointed to the sky. "Now then, let's be grateful we're all down here enjoying the springtime, Olwen." Ruthall was a big man for a priest; the warriors often jested with him as a devout man of God and said how grateful they were that he had been sent to Penhal to save them from the wicked Saxons. He loved the humour of the clan and always responded with a wagging of his finger. "You wouldn't want to go down there when you die, would you?" he would ask gravely, jabbing his finger towards the ground. "Well, Olwen, when is he off? Is he going up to Blaeno first? Does he know the way? I got lost when I came up here from Caerllion, you know." All priests seemed to worry too much, thought Olwen; they were always fussing. Ruthall had been at Penhal for just over two years, ever since his predecessor, poor Cunval, had been killed during an unexpected and particularly vicious Saxon raid. Olwen stared through the gateway of the neat cemetery. The priest's hut at the rear, near the spring, was hardly big enough for a group of people to sit inside. But its mud walls and thatched roof certainly made it cosy in the winter. Ruthall noticed the direction of her gaze. "I know what you're thinking, Olwen, how can I live in a cemetery? Well, there are only five graves. Anyway, look, here come the children, let's have some cakes." He greeted the panting children and invited everybody into his adjacent garden. "See, my field beans are sprouting. It's a lovely time of the year, don't you think?" The children heartily agreed, for they were looking forward to the summer and the thought of splashing about in the river. Meanwhile, back in the smoke and gloom of the hall, Rhys stood tall and adjusted his warrior's leather jerkin. He already had an air of authority about him, gained from his hard training with the warriors. His mother, Anharad, looked on proudly, but with an inner feeling of foreboding. Now that Rhys was sixteen years of age, and growing by the day, she could see something of his father in his stance. She was afraid that this meant he would now want to avenge the death of his father, killed by invading Saxons in a battle far to the east, even though Rhys had been only a boy at the time and could surely hardly remember him. Far closer to home was the death of his uncle, who had brought him up, killed in another battle only three years before. Anharad was not the only widow on the large estate. Rhys, with the weight of decision-making lifted from his shoulders, strode to the doorway and breathed in the clean air. He was still thin with youth, but riding and training with the warriors had given him strength and agility beyond his years. He smiled in a grown-up, confident way. The older people within the stockade had left their houses to congratulate him, for they were glad that their heir apparent was going to learn to read and write and not just follow the warriors into a life of turmoil and sudden death. A shout from the field interrupted the happy group. Gathering in the gateway, they could make out two horses approaching from the eastern forest - it was the Yarl Brochvael and his wife Gwenhaen. Brochvael eyed the gathering suspiciously and heaved himself off his big horse. He grudgingly turned and helped his wife down from her own horse, something he did not normally bother to do. Gwenhaen had already looked into Anharad's eyes and sensed the meaning of the occasion as Rhys took the reins of Brochvael's horse and wheeled the stallion around to tether him. "I expect to be off within a few days, grandfather," Rhys said. Brochvael snorted. "So be it! But remember, you will still have to join the warriors at Caerllion to carry on your training. If you ever take over this estate, you'll need to be the strongest of the bunch." Brochvael ruffled his grandson's curly brown hair. "Don't worry grandfather, I'm going to be as strong as my father and my uncle before I'm finished. You see, if I can read and write, I'll be able to send important messages for the army. I bet you sometimes wish you could write!" Brochvael snorted again. Just recently, he had begun to feel that Rhys had been answering everybody back and displaying definite signs of stubbornness, reminding him of the attitudes of his two dead sons. He snatched at the beaker of wine that Anharad had wisely brought to him. As usual, he spilt some of the wine onto his beard and cloak, but in draining the beaker he regained his composure. Leaving his elders to exchange news and pleasantries in the hall, Rhys led the horses down to the riverbank and tied them to a long hitching rope. As they grazed, a large hunting dog across the river barked and leapt into the rapids. "Hawk, here boy, here, let's go for a walk. I'll be away soon, you know." Rhys decided to go onto the moor and run along the ridge; he felt the need to stretch every muscle in his body. He was pleased that everybody now knew his decision. His grandfather and the estate warriors had hoped he would stay at Penhal and grow into a strong and skilful leader, but his mother and the rest of the clan were, he suspected, relieved that he would now go away to experience a more civilised life at a school. He jumped onto the bridge and strode across its creaking timbers whilst a yapping Hawk splashed through the river down below. As he approached the cemetery, the children rushed up and danced around him; in their eyes, Rhys was now a man. Ruthall shook Rhys warmly by the hand and grasped his shoulder. "I knew you would do it, Rhys; and you won't regret it, I promise you. Now don't forget, the monastery school comes under Bishop Dyfrig and is run by Abbot Aidan. You'll make wonderful friends amongst the monks and pupils, and you'll learn so much..."
Half listening to Ruthall, Rhys was thinking about the opportunities to come. Caerllion was going to give him the chance to see the sea-coast and the ships, and to mix with the famous army of King Myric and his battle-hardened warriors. He might even get to see Prince Arthur with his huge horse and sharp sword. Every soldier wanted to follow Arthur into battle; his reputation was fearsome. "I know you're a dreamer, Rhys, but you must pay attention to your teachers..." continued Ruthall. Rhys listened with half an ear. Despite the nuisance of attending the school in the monastery, which he knew in his heart was essential, he hoped to have plenty of time to learn all the skills of warfare. He had already learned some of the Roman tongue from Ruthall, although his attempts at writing numbed his brain. Although the monks would constantly preach Christianity, Rhys felt he could put up with all that if it meant achieving his goal of being a war leader when he was older. Rhys had met three priests in his young life, and he had loved and respected them dearly, but when it came to following the old gods like his pagan grandfather, or the new one God, he thought of how many more Britons the Saxons had managed to kill. As his grandfather loved to point out, the Saxon god, Woden, often seemed to be the strongest in a pitched battle. Realising that Ruthall's lecture appeared to be over, Rhys turned to the children. "I must go up to Blaeno tomorrow. Who's coming with me?" "Are you going to kiss Helena?" Olwen rocked her head back and forth with a big smile, well knowing what Rhys' reaction would be. "Shut up, you stupid girl," shouted Rhys, red in the face. "You can stay here if you're going to cause trouble." The rest of the children hooted with laughter. The last time they had all travelled upriver to Blaeno and played with the children of the farm, they had spied Rhys kissing the young Helena, daughter of the overseer. "I'm off," snapped Rhys and ran up the track-way onto the moor. He was flushed at the thought of Helena, and this was exactly why he wanted to visit Blaeno. During the winter visits, he had looked at her in a different light and she seemed to be willing to walk alone with him. The warriors had gruffly told him all about women and it had taken him ages to pluck up courage to ask if he could kiss her. Oh, yes - he could remember that glorious kiss. It had lasted for ages, until they had been interrupted by the sound of children giggling. Later, Helena's parents had smiled knowingly at Rhys, but had said nothing. And now, he desperately wanted to see her once more. The thought of how he would miss her had almost made him decide against going to Caerllion. However, he knew his destiny was to become a king's warrior. With all these thoughts racing through his mind, Rhys had run the whole length of the track-way. Even Hawk had lagged behind. He stared into the distance, recalling how, shortly after his uncle's death in a battle to the east, two marauding Saxons had attacked Penhal. His good friend, Cunval, had been struck down while defending the children. He glared across the Gwei valley and quietly cursed. After resting awhile, he became aware of shouts from the woodland to the north; the Penhal warriors were hunting a deer and it was coming in his direction. He climbed an oak tree to get a better view, just in time to see the hunting dogs bring down a stag. He could just make out the leading warrior jumping from his horse to spear the animal through the heart. A few minutes later, as the band of five warriors rode leisurely through the heather to the track-way, Rhys thought it would be a good joke to surprise them. He pressed his back tightly against the wide trunk. " Lie down, Hawk, stay there boy," he whispered. Arteg, the leader, headed the troop; the dogs, as usual, were just in front in case of an ambush. If the Saxons were ever to be intimidated by an enemy, then Arteg, big and powerful in his saddle, would be the man to make them quake. His long spear hung loosely in his hand and his sword flapped menacingly against his muscular thigh. Arteg was Rhys' hero; and he had always pushed Rhys to the limit. As the troop came up to the oak tree, Rhys leapt to the ground in front of them holding his hands up menacingly. "Stop, you heathens!" he shouted. "This is my land!" The dogs yelped as Hawk sprang at them barking furiously. Arteg cursed as his horse reared up and nearly threw him. The rest of the warriors burst out laughing; Rhys had certainly given them all a fright. "So," hissed Arteg mockingly, as he dismounted, "is the height of your ambition to frighten poor, innocent travellers like us?" "You'll all have to fight me if you want to pass," insisted Rhys, hands on hips. "You were lucky I didn't have my bow with me." Arteg moved swiftly. He ordered his dogs to pounce, then lunged forward to grab Rhys' ankle as he was stepping backward. Sprawling on the ground, Rhys looked up to see Arteg poised over him with his spear ready to strike. "Fool... you allowed yourself to be distracted; you're as good as dead." The rest of the warriors guffawed loudly. Arteg gave a big grin, gathered Rhys up, and threw him onto his horse. Rhys' hands came to rest on the still-warm deer straddling the horse's shoulders. The blood on its hide was starting to congeal. "If I give you that deer, will you take us to your priest and beg him to forgive us for our sins?" said Arteg in a solemn tone. The warriors found this all very amusing and smote Rhys roughly as they rode by. It was time to return to the settlement for their usual refreshment. "Well, I suppose so," agreed Rhys. Arteg was much too quick for him with his vice -like hands and bulging muscles. For the last two years he had been training Rhys in every form of combat - galloping and spearing, shooting arrows, fighting on foot with sword or dagger and most importantly, dodging and swerving to confuse an attacking enemy. The warrior band had all experienced battle with the Saxons. As the troop rode on ahead, Arteg took the reins of his horse and led Rhys along the track-way. "You still have much to learn, Rhys, but you're good for your age. Remember, you must have complete confidence. Never hesitate. I was only a young soldier myself when your father was killed, but your uncle Catvael was fearless in battle... too fearless. I wept when we brought his body back with us, you know." There was silence for a while. Rhys wondered how afraid he would be in a real battle – would he freeze in fright? "You'll get your revenge one day, Rhys, but don't allow hatred to cloud your judgement; always think carefully." "I've made up my mind, Arteg." "Yes, I know... you're going to Caerllion, aren't you?" "How did you know that?" Rhys felt that Arteg had always really wanted him to stay at Penhal, despite continuously whetting his appetite with stories of glorious battles. "I just knew. It will be good for you to learn how to read and write the Roman language, but you can still train with Arthur's army at Caerllion at the same time. I've been thinking, we can get Ruthall to write a letter to my good friend, Cynan, Prince Arthur's best captain, asking him to train you after school. He'll be able to fix it. After all, you were the best friend of his brother, Cunval, and Cynan will always remember that." The previous summer, Rhys remembered, Arteg and his warriors had joined Cynan in an expedition to seek out some Saxon raiders near the headwaters of the Tamesis River. "When we finally tracked down the enemy in open country," mused Arteg, "we rode them down before they could scatter. The Saxons rarely use horses, their strength is in numbers at close quarters with battle-axes and swords. Fortunately, they're not skilful with war-bows, but now they've found it unhealthy to make incursions into our home-lands, they've turned their attention to attacking our coast with their fast longships and making surprise raids at dawn. We never know where or when." Rhys sat proudly in the saddle. Caerllion might be a bit overwhelming at first, but there would surely be a chance to get close to Prince Arthur, the leader of the king's cavalry, and maybe take part in future expeditions. "I know I'll have to commit myself to the monastery school, Arteg, but every harvest time I'll be able to return to Penhal and then enjoy the late summer with you and the warriors." He was now too old to play games with the children; he had a man's work to do. When they arrived at the cemetery, they found the other warriors already drinking Ruthall's cyder. Large quantities had been made from the estate orchards in the autumn and Ruthall, although he could not refuse to share what had been allotted to him, was concerned that the warriors often seemed to end up at his enclosure after hunting or training. "Here, Rhys," called one of the warriors, "Ruthall is making some more honey-cakes, and with our favourite cherry jam!" Tough training was now forgotten. The children, despite an earlier breakfast, had eaten all of Ruthall's previous batch of cakes. They swarmed around the warriors, pulling at their beards. One of the warriors had gutted the deer and was busy chopping up some of the still-warm entrails for the dogs. Hawk gratefully joined in. "Now, Ruthall," said Arteg. "I want you to write a letter for me. I want to send a message to my old friend Cynan." Rhys hoped he could help with the composition of such an important letter. "I'll just leave these cakes cooking," said Ruthall as he moved two sloping flat stones nearer to the fire. Ruthall always looked so awkward in his long brown tunic, thought Rhys. "Now Rhys, this will be a good chance for you to help me translate Arteg's message into Latin, and, no doubt, Cynan can get one of the monks in Caerllion to read it back to him. I have some parchment and a quill in my hut." Rhys pulled a face, but knew that the children, particularly, would be watching him with great interest. "Greetings, Cynan, dear friend," dictated Arteg staring up at the sky. "Could you train Rhys after school..."
"Not too fast," pleaded Rhys as he and Ruthall both struggled to get the words set down correctly. The children crowded around to see the letters being formed. They had all practised scratching their own names onto newly-made jars and mugs at the pottery kiln, but writing a complete message was a mystery to them. Arteg struggled through his letter with help from Ruthall and then the parchment was laid out to dry. "There," said Arteg, clapping his hands with satisfaction, "now, are those cakes ready?" The rest of the day was spent in jousting and archery on the big field. Rhys was now so accurate with his bow and arrows that he almost matched the warriors in target practice. Arteg walked over to Brochvael who had been watching from his bench and sipping wine. "Rhys will become a champion within a few years and Caerllion will be just the place to continue his training. I've sent a message to Cynan to take him in hand." "We'll see," muttered Brochvael through his dirty beard. The old man loved his grandson; he could see his own dead sons in Rhys' features now that he was growing up. "I sorely wanted him to stay at Penhal where we could personally groom him as heir to the estate, but I know that letting him go to Caerllion might well be in the best interests of the family. I only hope he's not sent into battle..."
Arteg sighed. "If he has to go into battle under Prince Arthur, he'll be in good hands." Brochvael scoffed. "I remember that young Arthur. An arrogant, spoilt pest of a lad. However, I've heard he's certainly a leader of men now he's been trained by his father, my old friend King Myric. Apparently he's as clever as a raven, as cunning as a fox and as brave as a dog-wolf." The morning mist gave way to sunshine as preparations were made for the journey upstream. Olwen, as the oldest girl, was to ride one of the bigger horses with Fach, the smallest boy, sitting in front of her. Fach, always cheerful despite his malformed leg, grinned proudly at the other children as they were helped onto their ponies by the farm labourers. The labourers were glad to help the children; this was a welcome diversion from their early morning march to the fields for the back-breaking job of ploughing and harrowing. Rhys swung himself up onto Beech, his own unpredictable stallion. The other warriors had been wary of Beech while he was being broken in, but Rhys was able to talk to him quietly and tell him secretly of his plans to ride east one day. As the dominant horse, Beech had the lead position and Rhys allowed him to rear and whinny in front of the other horses. After settling him down, Rhys was handed two large jars of wine to strap carefully onto his saddle and some metal tools as gifts for Blaeno. Food and milk were slung across the ponies, and everything was ready. This was the first spring that Rhys had been put in charge of any expeditions. As a grown lad and a future leader, lately he had been given more and more responsibility by Brochvael. As the party proceeded upriver, Rhys kept a look-out out for any danger from the parts of the bank gouged out by winter floods. The river level was still high and the water looked icy cold. "There we are, children, the first flowers and buds, there where it's sheltered." Rhys pointed out the various signs of early spring. Rhys' mother called this the 'magical re-birth of the land' – a saying older than time in the Celtic world. When they reached half-way, Rhys led the file up a steep slope to gain a high vantage point for their rest-stop. Olwen, as usual, took control of the laying out of bread, cheese, milk and eggs, then finally gave them permission to start eating.